VATICAN CITY (CNS) — The end of one calendar year and the beginning of another is the perfect occasion to reflect on how well people have used the time and gifts God has given them — especially how well people have helped the poor, Pope Francis said. As a strong winter wind blew outside, Pope Francis ended 2014 celebrating evening prayer with eucharistic adoration and Benediction, and the solemn singing of the “Te Deum,” a hymn of praise for God’s blessings. Pope Francis made specific mention of the Rome corruption scandal that became public in early December; investigators claim millions of dollars’ worth of public contracts were awarded for waste management, housing immigrants and other programs, but the services were never provided or were not at the levels called for by the contracts. 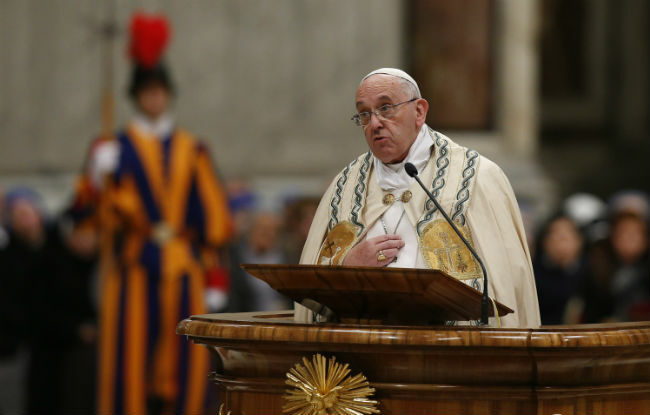 Pope Francis told those gathered in the basilica that all people, even Christians, have “a tendency to resist freedom; we fear freedom and, paradoxically, we prefer slavery” although often people are not aware that that is what they are doing. After the prayer service, despite the cold, Pope Francis went into St. Peter’s Square to pray before and view up close the Nativity scene. With hundreds of people huddled behind barricades, he spent about 20 minutes greeting the crowd, as well as offering a personal “Happy New Year” and handshake to the Italian police officers on duty.